Nearly 70% or `45,042.07 crore of the overall dividend value was announced within a month of the Union Budget, showed data from Capitaline, a financial database provider on Indian companies. Mumbai: Listed Indian companies rewarded shareholders with dividends worth ₹ 65,385.21 crore during the three months ending 31 March, the highest amount in any January-March quarter. Firms rushed dividend payments to avoid tax liabilities after finance minister Arun Jaitley, in his budget speech on 29 February, introduced a 10% tax on individuals receiving dividend income in excess of ₹ 10 lakh per annum, starting 1 April. This levy is over and above the 20.47% tax that Indian companies pay as dividend distribution tax (DDT). Nearly 70% or ₹ 45,042.07 crore of the overall dividend value was announced within a month of the Union Budget, showed data from Capitaline, a financial database provider on Indian companies. Market experts said that large dividend payouts, though uncommon during this time of the year, were intended to beat the new tax rule and were, therefore, on expected lines. Many Indian companies have high promoter holding, which translates into significant amount of dividend income for such promoters, including the central exchequer where state-owned companies have a huge pile of cash on their books. “Dividend payout in the last one month was a one-time opportunity for promoters and large shareholders to avoid tax liability. It was expected given the change in rules," said Pranav Haldea, managing director, PRIME Database Group, a primary market tracker. Data showed that 20 state-controlled firms announced dividends worth ₹ 31,980.27 crore. The government appeared to be the biggest beneficiary as it received ₹ 24,180.80 crore in additional revenue from public sector undertakings, including Coal India Ltd which alone gave out ₹ 13,784.85 crore, data showed. Also, 400 non-government companies announced dividends worth ₹ 33,404.94 crore. Top names include Hindustan Zinc Ltd ( ₹ 10,140.76 crore), Reliance Industries Ltd ( ₹ 3,401.17 crore), Bajaj Auto Ltd ( ₹ 1,446.83 crore), Hero MotoCorp Ltd ( ₹ 798.75 crore) and Housing Development Finance Corp. Ltd ( ₹ 473.61 crore). Mint reported on 9 March that nearly 275 companies had announced board meetings within 10 days after the Union budget to consider payment of interim dividends, among other resolutions. Such dividends had to be credited on or before 31 March due to the cash accounting system followed by a majority of individuals. Under cash basis of accounting, revenue and expenses are recorded on the date when money is received or paid. On the other hand, mercantile (also known as accrual) system allowed a dividend paying company to complete all legal formalities to declare dividends by 31 March and allow the legal right to receive such dividend accruals to the shareholder even in the new fiscal year without attracting additional tax burden, said the Mint report, quoting tax consultants and lawyers. In 1997, then finance minister Yashwant Sinha first introduced DDT at 10% on distributing dividends. This was removed in the Union budget of 2002, allowing dividends to be taxed in the hands of the recipients instead of companies. In the 2003 Union budget, the government re-introduced DDT with a higher rate of 12.5%, which was increased to 15% in the 2007 budget. In April-June last year, companies announced dividend worth ₹ 86,562.87 crore. These were largely in the form of final dividends after issuing full-year financial statements for fiscal year, according to the Capitaline data. 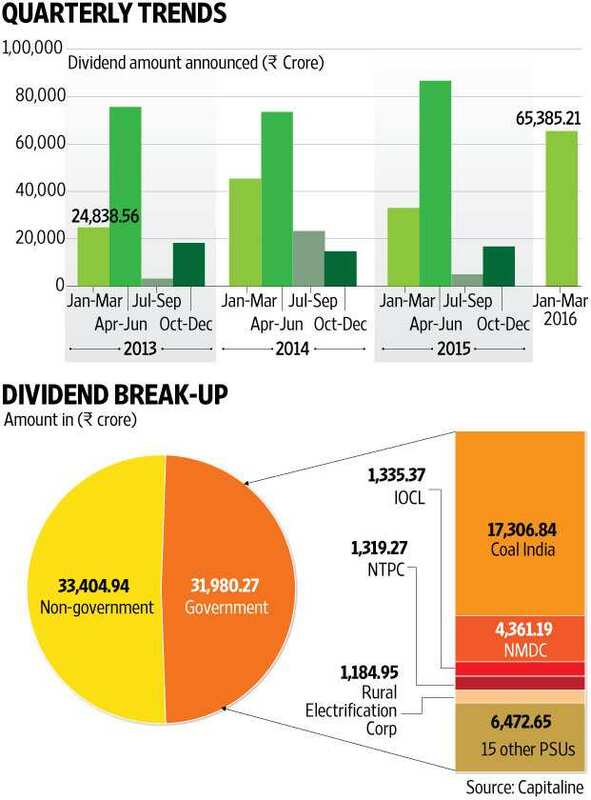 In April-June 2014, companies had announced dividend worth ₹ 73,430.96 crore, data showed.